According to a federal study, the odds that an American student will die in high school from violence are one in a million – or even less. While major episodes of school violence are rare, the survey concluded that signs of mental illness in the adolescents who carry out these crimes are not. 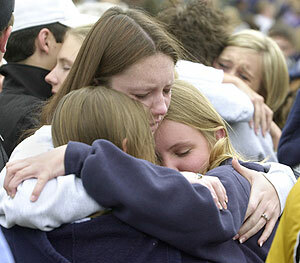 It found that most school shooters have a history of suicide attempts, suicidal thoughts, depression or anxiety. In addition, experts say, the majority of these killings are pre-meditated. They are also carried out by kids who harbor severe, specific fantasies of violence. What causes kids to act out a violent fantasy? According to the experts, two major factors include mental illness, and social isolation. Dr. Robertz studies the kids behind the school shootings so familiar to us now we reference them in shorthand: Columbine, Paducah, Pearl, Jonesboro, Northern Illinois University, Virginia Tech. Overseas, too – in Finland, and in Robertz’s native Germany. In March of this year, a teenager in Winnenden, Germany, went on a shooting spree that began at his former school and ended with 16 dead. 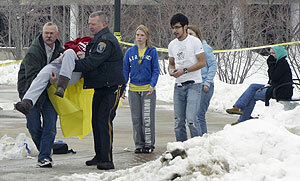 The gunman, age 17, shot himself after a confrontation with the police. Robertz focuses on the fantasies of these shooters, which he says are often aired publicly before the killings are carried out. From private diaries, to home videos, Web pages and school papers – the perpetrators of school shootings have almost always put the word out about their grievances and their plans well in advance of carrying them out. And Columbine killers Eric Harris and Dylan Klebold made a home movie for school about wanting to kill their classmates, in addition to a “to do” list – including the purchase of bombs and guns – leading up to the massacre. By studying these warning signs, Robertz and his co-workers have developed strategies they say can help identify students at risk for acts of violence, before it’s too late. “In my opinion every one occurrence [of school violence] which has happened would have been preventable,” he says. Robertz, who has interviewed school shooters, adds that his most surprising finding is how often these kids cry for help. **For more facts on school violence, visit the National Youth Violence Prevention Resource Center online. 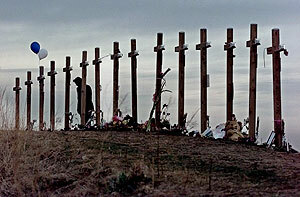 The Center, founded in 1999 in response to the massacre at Columbine High School, offers information and statistics on youth violence and prevention, and intervention strategies for the general public.